A new study in Nature, published in March 2018, revealed novel potential adverse effects of a broad variety of marketed drugs. The researchers found that many drugs designed to target human cells and not microbes could inhibit the growth of different intestinal bacterial strains. This suggests that these drugs can alter the gut microbiota, in turn leading to adverse effects on human health. The study was an extensive screening exercise where the authors used in vitro testing to investigate the effect of 835 different non-antibiotic drugs on the growth of 40 bacterial species which represented the commensal human gut microbiome. Of the 835 drugs, 203 (24%) displayed anticommensal activity by inhibiting growth of a few gut bacteria species to more than 10 species. To validate the findings, the authors searched the literature for evidence in human studies. They did find a high concordance between the drug effects found in vitro and in the gut of humans, vindicating the in vitro screening results. For instance, proton pump inhibitors (PPIs) inhibited the growth of the same bacterial taxa that were also found to have reduced abundance in human patients taking PPIs. Another example is the finding that Akkermansia muciniphila had high in vitro sensitivity to atypical antipsychotics (AAPs). Patients using AAPs are reported to have lower abundance of this bacterium compared to healthy controls. This study is the first large-scale study to demonstrate that drugs targeting human cells can negatively impact the gut microbiota. 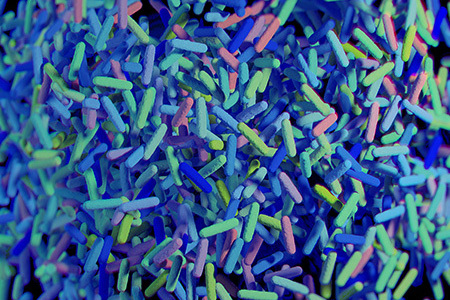 Adding to the complexity, gut bacteria can modulate drug efficacy and toxicity. The authors propose that their work creates a starting point for guiding "translational applications in mitigating drug side effects, improving drug efficacy, repurposing of human-targeted drugs as antibacterials or microbiome modulators, and controlling antibiotic resistance." The first step, however, is to test the reported in vitro findings in in vivo animal models and subsequently in clinical trials. One highly relevant animal model in this context would be the germ-free mice associated with human bacteria to test how different drugs impact the microbiome composition and potentially the mouse phenotype.